Nielsens is still unpacking great selections of Nambe, Julia Knight, Waterford, Olivia Riegel, Lladro, Herend, Lalique and Mark Roberts Fairies! Plus we have Judith Leiber Jewelry, Mary Frances Purses and Vietri and Juliska and Wendell August and so much more! You can spend $5 for a hand-made china flower or $60,000 for a fabulous limited edition Lladro Chandelier or any anount in between. Nielsens has the right gift for every occassion! You may shop at either of our Tulsa locations; 81st & Lewis or 3515 S Peoria or NielsensGifts.com or just call 918-298-9700 - we will wrap up all of your shopping! Nielsens offers layaway too! Many people are putting great items in layaway for Valentine's Day, Anniversarys, Birthdays and Mother's Day! Just put a forth down and we will save the treasures for you! Layaway is great for getting that limited edition or signed piece that will not be available for long! We ship anywhere and enjoy getting to know our wonderful customers all over the world! Just call and we will write your enclosure card with your sentiments and gift wrap and mail for you! May I suggest the Copper Canyon by Nambe for the man in your life! It is great for a couple too. Also our wonderful Tokens and Icons money clip wallets with the vintage coin decor is perfect for a man or woman. Men love them! They are also available with parts of golf balls or baseballs played by famous players - they come with all the information about where these great pieces have been! Please come to Nielsens for The Finer Side of WOW! We will fill all your gift giving lists! Isn't it fun to give fabulous gifts to show your love! Nielsens wants to be your gift store! I appreciate you! Merry Christmas! Fun This Friday Eve- Join us April 20th at 81st and Lewis !!! Nielsens will welcome artist, Jose Santaeulalia from Valencia, Spain this Friday, April 20th. From 6-9 Jose will sculpt a Lladro right in Nielsens at 81st and Lewis! We will make a party of it! Please join us to welcome this famous artist from Porcelain City- Lladro. He will also sign and personalize any Lladros purchased from now until 9pm Friday the 20th of April. You may also select Lladros to be signed at NielsensGifts.com . Nielsens has been a Lladro dealer since the early 1960s! My mother, Dorothy Nielsen, started offering the five original Lladro Angels in Nielsens Exclusive Gifts when Lladro first starting exporting their exquisite and sought after sculptures. She loved the little angels, that are still available today, because they have personality! Please join us by phone, web, or in person this Friday at Nielsens in Tulsa for this rare opportunity! I can not wait to see the Limited Edition Koi Fish and the limited edition Chinese Beauty. I know that you will have favorites too. The new Cowgirl and Cowboy are adorable! Lladros have expanded the type of sculptures that they do over the decades. You will be surprised! Let me know how I may help you get the Lladros of your dreams and get them signed! Nielsens has layaway, we will ship them for free for this event - just ask. Nielsens gift wraps for those special birthdays, anniversaries- even layaway and wrap for Christmas! Nielsens will match any dealer prices and Nielsens will even benefit your favorite charity when you purchase- just ask! Market 2011 Brings New Exciting Gifts and Home Decor to Nielsens! I cannot remember a more exciting market! The products were fresh, the buyers in great moods and Doug was always ready with a funny quip! Doug, George and I were in easy agreement to bring many new and some contemporary new lines to you at Nielsens. Vagabond is a new line filled with nature inspired wood and metal serving items - even a cow and pail sugar and creamer and shell and coral shaped serving spoons! Vagabond will have the perfect gift for the person who has everything. There are great things for those with a lake, beach or mountain home! We love the elegant simplicity of our new Simon Pearce bowls and vases. We are thinking they will be great for Valentine's Day and Mother's Day. Simon Pearce will even engrave your special saying on the rim of a beautiful clear bowl for you! We ordered one with XOXO all the way around! Brides will love the Simon Pearce stemware too. This beautiful glass is made in America! Table Art is a wonderful handmade in America art items for your table. Napkin rings, serving spoons, and salad servers in wonderful shapes of natural leaves and flowers. They also have a lovely dogwood frame for mom! Faye and Annika's new Gourmet room at Nielsens will have some wonderful new baking pans that the girls love using. God mother, Lucia had given them one that they make garden bug shaped muffins in- now they bring them to you! There are also pans to bake heart shaped cakes for Valentine's Day! They have also added the best Vanilla in the world in big pretty bottles! And our family loves Door County Wisconsin - so we have added Door County Gourmet coffee! Hope you will like their great flavors too! Wooden salad bowls will make great wedding gifts! Our new very natural bowls handmade from reclaimed wood will also be great gifts for the man in your life! Nambe also brings to Nielsens new salad bowls, servers and great cheese boards! My parents stared carrying Nambe in the 1950s at Nielsens, so I am so happy to have a new offering from this Native American company. Waterford has lots that is new also. We are so glad that they are doing a new cased crystal flute with the cut of snowflakes. You can acquire one color per year and all the snowflakes will be different each year! This year is red and gorgeous. You may just want 12 red ones! We bought lots of Waterford Vases for Valentine's Day gifts and for Mother's Day. The new black and clear John Rocha Waterford has a fabulous new ice bucket! And we all want the individual Marquis wine carafes. They are a fun shape and very reasonably priced. Lismore Essence is Nielsens' bride's top pick! Lladro has great new pieces for Mother's day . We love the new Limited Edition Tango piece- you have to come and see it! Lladro makes the prettiest wedding cake toppers you can find. Nielsens has them all. For Valentine's Day there are many romantic pieces. I like Endless Love and the little girl holding a heart full of handmade flowers! Oprah's favorite china tea cups are at Nielsens now- in a set of each a different color with a heart shape showing as you sip! They are very reasonable, so give them as gifts to girl friends with a delicious package of Nielsens' Republic of Tea flavor. It makes a great reminder that we should sit and sip and share with friends more often! Penzo handmade African Pottery had lots to share with their art that benefits women, children and wild animals in Africa. We purchased several one of a kind hand thrown pieces for you along with more serving pieces and fun bowls. No two are ever alike and each is signed by the artist! George and Annika and I had the wonderful pleasure of meeting Penny Vincent who coordinates the artists. She is delightful and a wonderful artist in her own right. I hope she will visit Nielsens and meet you all! You will love and admire her too for all she does for so many! You help too by enjoying the beautiful Penzo pottery! What great gifts it makes - it gives in many ways! How wonderful! We also had the wonderful experience of visiting Tervis Tumble factory in Venice, Florida. Tervis Tumblers keep things hot or cold, don't sweat and can be put in the dishwasher and microwave. They are made with the utmost care and love in America by the nicest people! It was great to see it firsthand. Nielsens will have a design in stock that will appeal to anyone. You will find a great gift in the new designs by Tervis! Nielsens is happy to have a large selection for you. We can also do corporate custom orders for you! Herend's new Guild piece is the Penguin! It is fun and you will really like it. Rothschild Bird has added many serving pieces to their new Branch pattern for the 150th birthday of the Rothschild Bird pattern. Herend continues to be a favorite china for brides and everyone. It is all handpainted - art you can use! One of Doug's accomplished goals at market was to find great gifts $50. and under. You will love the Tuscan pot filled with a scented candle - perfect for use inside and outside. What a perfect gift for all occasions! He also chose fun - really funny cocktail napkins and great signs with inspiring sayings and great gift notes. You will love all the gifts- come to Nielsens to see and let Doug and Sadie suggest the perfect gifts for all your friends! Julia Knight has designed beautiful new trays, vases and bowls. You will love every one! I will purchase the green water lily platter and the pink raspberry glass bowl and the beautiful vases in 3 sizes with the bright color inside. And the new elegant tray will be perfect on my Ottoman! You will be tempted too! Julia Knight makes great hearts for Valentine's Day and the Vases will be the best for Mother's Day gifts! We loved spending some time with Julia. She is so creative and inspiring. She has more wonderful things for us on the drawing board. Nielsens looks forward to her visit again next fall! She makes entertaining our friends fun! Valentine's Day is almost here and Nielsens has the best gifts ever! Julia Knight hearts, Simon Pearce heart bowls, vases in all brands and shapes and sizes, Lladro, Herend, Waterford and Lalique hearts, and Nielsens even has chocolates for your love- Come and see the chocolate heart shaped dessert cups! Nielsens will gift wrap and deliver or ship for you to make your gift giving easy! My gift for you is mention my blog and receive 10% off any new purchase from now until Feb. 14th - mention "Andrea's Blog" in store or put "andrea" in coupon code box at our website online checkout. Wish you could have been at market with us, but come to Nielsens - we brought the best of market to you at Nielsens! George is working at putting some of these great offerings on http://shop.nielsensgifts.com/. You may also shop by phone 1-800-665-1233 or in Tulsa 298-9700! It Started with an Angel...a Lladro Angel! Nielsens is known for their huge selection of Lladro fine porcelain. It all started with an angel in the early 1960s! My mother, Dorothy Nielsen, chose a darling group of angels 50 years ago! She was at market in Dallas when a representative asked my mom "Mrs. Nielsen, do you think your customers in Nielsens would enjoy these porcelain angels made by the Lladro brothers?" She said, "yes!, because they have personality!" She was right- they loved them and...You will today,too! These fun angels are in Nielsens store and on www.NielsensGifts.com today! I believe these angels along with the Waterford L ismore pattern, Waterford Colleen pattern, and a variety of Lalique art pieces are the only items that are still popular at Nielsens today that were popular 50 years ago! They really have stood the test of time! One of the angels is praying and is great for Baptism, first Communion and baby gifts. Two of the angels - my mother used to say "I think they have been in a little mischief!" This year, to commemorate the wonderful angel story, Lladro has created a fabulous limited edition angel for our Signing event, Oct 16th! 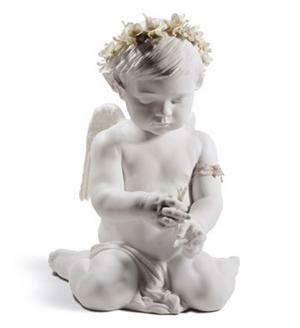 This very special Lladro sculpture is called "Cherub of Love". It has delicate adornments and captures the human emotion of LOVE. The large angel is crowned with finely executed wildflowers. The angel is plucking daisy petals..."loves me, love me not, loves me!" You may have this fabulous creation signed by Rosa Lladro at Nielsens Oct 16th, 2010! Nielsens would love for you to come and meet Rosa from 2 to 4 Sat, Oct. 16th, but if you cannot, we will have your Lladro selections signed and personalized and sent to you or your gift recipients! We will enclose your card and gift wrap and send all your gifts from Nielsens! We make sending love easy! Lladró was established by the brothers Juan, José and Vicente Lladró in 1953 in Valencia, Spain. Since then, Lladro has undergone an amazing metamorphosis from an artisan workshop to a huge studio that holds a presence in over 120 countries and is at the forefront of contemporary porcelain design. Lladro employs many artists including quite a few with physical challenges. My husband and I are also interested in the Center for Individuals with Physical Challenges here in Tulsa, therefore this employment strategy makes us happy! If you mention the Center at time of your purchase, Nielsens will donate 10% of your purchase to the Center! Nielsens Gifts was founded by Art and Dorothy Nielsen in Tulsa 64 years ago. Nielsens is now owned by their daughter, Andrea Nielsen, and has been at the Plaza, 81st and Lewis for 16 years. The Nielsen family business and the Lladro family business have been associated for 50 years! Charlie, our dog, really likes the Lladro angels, but is especially drawn to the wonderful dog pieces Lladro makes today. Our daughter Annika's favorite piece in the entire Nielsens store is Lladro's Can't Wait! We can not wait for Rosa Lladro's visit to Nielsens Oct 16th! We hope you are excited to choose some beautiful Lladros to have signed and personalized! If you cannot decide which ones to get, you can not go wrong with the angels! Mention this blog and my gift to you will be free shipping and a Nielsens' gift certificate with a value of 10% of your purchase. This gift is available until Oct. 9th! Rare Lladro Signing Event at Nielsens Gifts with Rosa Lladro, President of Lladro. This is lovely Rosa Lladro. Variety is the Spice of Life! Nielsens Gifts is not copied anywhere! Nielsens Gifts - An Original... One of a Kind! Have you noticed when visiting another city that all the stores are the same ones you have in your home town? I remember when it was so much fun to shop in a special store unique to Chicago, a special one in Dallas, one only found in New York. Now all of those stores are in many cities-but they have lost their personality. The owners are not individuals, but big conglomerates. The stores have prestigious names, but many out source their work and are mere shadows of what made them famous. Big business was never Nielsens Gifts' goal. Nielsens loves knowing their wonderful customers in Tulsa and on the phone and on NielsensGifts.com. That is the way Nielsens' founders planned it. Founded in 1946 at the edge of Tulsa, Oklahoma. I have been thinking so much about my parents, Dorothy and Arthur Nielsen. They had a vision for their gift store 64 years ago. They did not want a chain of stores. They wanted only one very unique business. The store, Nielsens, started in a rental house in Tulsa. They lived in the back and sold their wedding gifts in the living room and my dad made lamps of customers lovely vases and figurines and my mom made the hand sewn silk lampshades. They wanted to bring beautiful decorative things to Tulsa from all over the world. Lovely things had not been easy to find during world war two. They began bringing china and decorative accessories to help fulfill peoples dream of peace and prosperity. New merchandise comes in almost every day! I worked all weekend in Nielsens Gifts cleaning and doing some new displays of Julia Knight Serveware and Lladro and Kinzig Design Lamps. We are excited to have Rosa Lladro visiting Nielsens on Oct. 16th. I got to thinking how much fun I was having and that there is not another store in the entire world with our exact mix of merchandise! Although the choices are now made by myself,my husband, my daughters, Doug, George, Rhonda, Sadie, other Nielsens' sales associates and by our customers-not by my parents, we still abide by Art and Dorothy's philosophy that Nielsens carry all price ranges of gifts and objects of art, but of only items of the highest quality! Please visit our one and only Nielsens Gifts in Tulsa and on the web. Our son, Greg, designed our site and George works night and day on our web site. There is not another like it! NielsensGifts.com. There is no "out sourcing" at Nielsens! We are also available to talk with you on the phone 298-9700 or 1-800-665-1233 to help you find the perfect gift or china or flatware or crystal or home accessory. We are happy to special order for you. We gift wrap your selection for free and deliver in Tulsa and ship all over the world! We have Bridal & Gift Registry. Please let Nielsens be your unique gift store. Please let us be your personal shopper whether you need a special birthday, wedding or anniversary gift or if you need special corporate gifts, we will be honored to help! A Gift from Nielsens is Treasured Always! My parents always said..."A Gift from Nielsens is Treasured Always!" They helped people send and give love to their friends and family through beautiful gifts - just as we do today.